On the iciest day of the year, Warren and I took the boys (satchel, almost 4, and Jiro, almost 2) to Sekisui in Midtown. I was having a sushi breakdown, but didn’t want to drive on the icy roads all the way to Sakura. Warren and I had eaten at Sekisui on New Year’s Eve, minus the monkeys, and had tried lots of new rolls. Since Sekisui is small and often crowded, it has never been at the top of my list of places to take the monkeys. I figured the ice would keep the crowds at bay long enough for us to have a quick dinner. The monkeys were hungry and Japanese food is always a hit, so we went for it. My prediction proved correct and the restaurant was practically empty. (It was 6:00pm on a Saturday night!) We were seated in a booth next to the sushi boats, which were thankfully empty and motionless. (Later I noticed that the fish tank was empty and the water fountain wall was also off—maybe due to the weather?) The boys immediately started dipping their fingers in the water, eager to figure out why the boats weren’t moving. The waiter came over and handed Warren and I each a hot towel and a cold glass of water. He stared at the monkeys like he had never seen children before. “Can we get two waters in Styrofoam cups?” I asked. My question seemed to snap him into reality and he looked a little sheepish, clearly embarrassed that he had overlooked two of the four people in our party. “And an order of edamame,” I added. Buoyed by my experience on New Year’s Eve, I started scanning the menu for undiscovered delicacies. “Ooh, various seafood wrapped in seaweed and deep fried. That’s sounds good,” I said. “Uh-huh,” Warren said, humoring me as conducted his own investigation. “Mmm…deep fried tuna,” I continued. The waiter reappeared with water and edamame for the monkeys. “Is this good?" I asked, pointing to the deep fried seafood dish I couldn’t pronounce. He politely shook his head. “What about the deep fried tuna?” I asked. Warren ordered his usual tonkatsu and requested chicken-katsu for the boys. (Katsu means breaded and deep fried.) The katsu dishes come with tempura vegetables and everyone’s favorite, miso soup. As we devoured the edamame I wondered why I could never get it taste as good at home. “You just boil it,” I said to no one in particular. 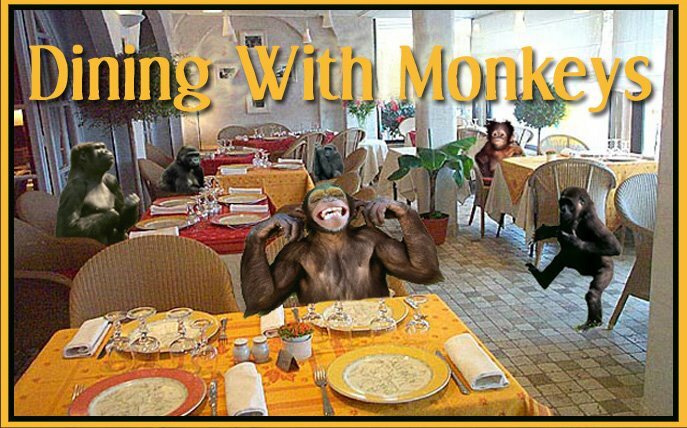 The soup came soon after and the monkeys were so busy eating they didn’t have time to act crazy at all. As far as I could tell, once the stagnant sushi boats were deemed off limits they had turned their attention to eating. “Maybe he’s trying to save you from yourself,” Warren joked. I had decided to forgo the Japanese fried cheese, but I saw the waiter en route to the bathroom and asked if maybe it was just taking a long time. As I shuffled Satchel into the ladies room, I saw the waiter secretly enter the forgotten cheese order into the computer. By the time we made it back to the table, the cheese tempura was there in all of its greasy, glistening glory. For some reason I was surprised to see that it was cheddar cheese. I had expected something closer to the fried cheese one would find at a Friday’s or a Chili’s. The tempura process had made it soft, but not entirely melted. Instead of the stringy texture common to America varieties of fried cheese, it had a gooey, crunchy one. It was pretty damn good if I say so myself. Jiro, lover of all things cheese, couldn’t get enough. Between the two of us it was gone in no time.